Kass Morgan’s THE 100 is brimming with potential. It has all the hallmarks of epic sci-fi: three-hundred years ago, Earth was devastated in a nuclear war, and humanity now lives on interconnected space stations referred to as the Colony. For our planet’s survivors, life isn’t easy. The space station is deteriorating. It was never a solution, always a band aid, and as our story begins, resources are running perilously low. A return to Earth is their only solution, and to test the environment, 100 teenage prisoners are sent to the planet; they are effectively guinea pigs. But their survival possibly represents humanity’s survival. The mission they have been chosen for is vital. 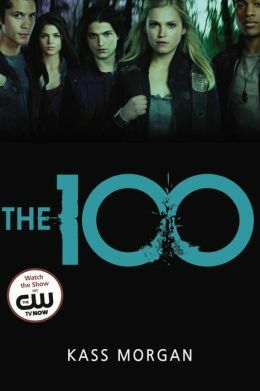 Unfortunately THE 100 isn’t quite the sci-fi epic I was hoping for. Based on its blurb I was expecting LOST with teenagers; a YA spin on the classic Lord of the Flies. Something innovative. Something fresh. What I got was a teenage relationship drama set in a dystopian future; romantic shenanigans set on a devastated Earth. There are hints at what could’ve been – and what still might be – but this is a series firmly founded on melodrama rather than fully exploring its narratives potential. It tries to pack emotional punches, but some of the circumstances are far too contrived to carry real impact; relationships switch from loathe to love within a couple hundred pages. Things are just too rushed. While there are plenty of interesting developments, there is so little nuance, and so little time to absorb the impact of a character’s decision, before we shift to a new scene featuring another character. Morgan adopts plenty of flashbacks to delve into her character’s backstories, but they’re effectively cardboard cut-outs; there to play their role, rather than offer anything memorable. You will not find a Katniss Everdeen in these pages Clarke, Wells, Bellamy and Glass don’t come close. There’s plenty of potential for this series, and I’m willing to give it a second chance. But the pace needs to slow down for the sake of character development and making the most out of their relationships. While I powered through all 300+ pages of THE 100, very little resonated with me. Give me something to hold on to! There are plenty of good ideas on display; part of the writing process is selecting the best ones to explore. Instead, it feels like we’ve got watered down versions of ideas with lots of potential. I truly hope that potential is realized.